Truckloads of organic beets began arriving at Eastman Business Park from area farms earlier this year – more than 4.8 million pounds of them. Their destination: a warehouse located at Building 508 on the southwest end of the EBP campus in Rochester, NY. Here, workers at a newly-refurbished processing and packaging facility have begun meeting consumer demand for cooked, marinated, shredded, sliced, diced and juiced beets … plus snack bars for kids, and chips and salsas for Super Bowl Sunday gatherings – all under the “Love Beets” name brand. 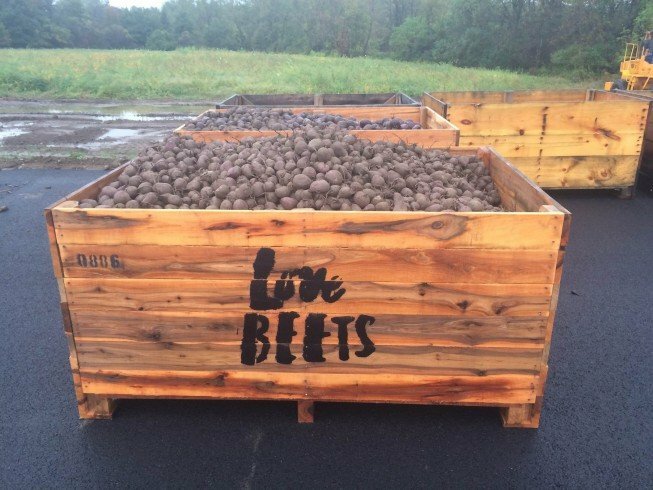 The new Love Beets production plant, a joint venture of UK-based G’s Fresh Ltd. and Fairport, NY’s LiDestri Foods, Inc., is up and running in Rochester. It’s the latest in a growing list of food processors who are investing serious cash into the Greater Rochester manufacturing economy. Across the region, businesses are cropping up. They are filling bottles, cans, jars and all types of container with wine, sauces, yogurts, flour, juices, jams, jellies, plus ice cream with every conceivable kind of topping. And now, we’ve got beets. So why is Greater Rochester and, more specifically, Eastman Business Park a likely choice for this budding enterprise? Dolores Kruchten, Vice President of Eastman Business Park; Phil Varuso, Vice President of LiDestri Foods; and Dave Stoklosa of Love Beets, recently took on that topic. During a weekend radio talk show, the three discussed the advantages of locating food processing businesses in the Greater Rochester area. They also revealed a bit about their own plans for growing the food processing business at EBP, where both LiDestri, a long-standing local manufacturer of sauces and spirits, and Love Beets, the newcomer to the region, have separate as well as cooperative manufacturing operations. All of the participants agreed on three key factors for the progress: first is proximity to customers – one-third of the North American population is within 500 miles of Rochester. Second is proximity to growers – Western New York’s rich soil makes for an agricultural hot bed. Third, Greater Rochester has the skilled workforce, coupled with the necessary facilities and infrastructure to support the food processing industry. The formula for Love Beets’ success, Dave Stoklosa suggests, makes for an interesting case study. According to the New York State Cooperative Extension, western New York is the second leading producer of red table beets in the U.S. Beets grow faster than other root vegetables, an absolute must western New York’s shortened growing and harvesting season. In addition, beets behave much like apples – another WNY mainstay. They can hold their shelf life for up to 1 ½ years, given proper refrigeration/freezer techniques. Next, beets need lots of fresh water for processing, as well as an environmentally responsible manner for handling waste by-products. They also need cost effective power for processing, plus access to transportation systems for both delivery and distribution. All are features at the vertically-integrated Eastman Business Park, one of the country’s largest manufacturing facilities. Dolores Krutchen said the LiDestri/Love Beets collaboration fits EBP’s strategic interests for expanding the manufacturing base both at the Park and for the region. In addition, beets in these parts needed a favorable business environment, and they got it. Installation of the $18 million Love Beets plant received $1 million in NYS tax breaks to seal the deal. Stoklosa said operations have gone from two people six months ago to more than 50 today. There is a need to add a second shift soon, with the goal of 140 employees in three to five years. Those jobs are staying local, Stoklosa said: "We don't have to recruit from outside Rochester, and frankly, we don't want to." To hear the entire radio broadcast, click here.